Updated Thursday January 11, 2018 by AUBL Miami. Championship series game 2 Boca Red Sox vs South Dade Toyota Braves will be broadcasted on the AUBL Miami Baseball Network this Sunday 1/14/18 at 10:30 am. Watch game here http://www.ustream.tv/channel/aubl-miami-semi-pro-baseball. Announcers will be Jay Habacht, Sean Stanley, Christopher Femino and Stephen Monte. Game 1 was an epic battle! Braves Pedro Rojas won the game in the 10th inning with a 2 run walk-off blast. The Boca Red Sox beat the #1 seed Coral Gables A's 9-3 on 12/17/17, continuing their hot playoff run. This comes after defeating Team Puerto Rico in a walk off thriller 8-7 12/10/17 and routing The North Miami Orioles 8-1 in round 1. 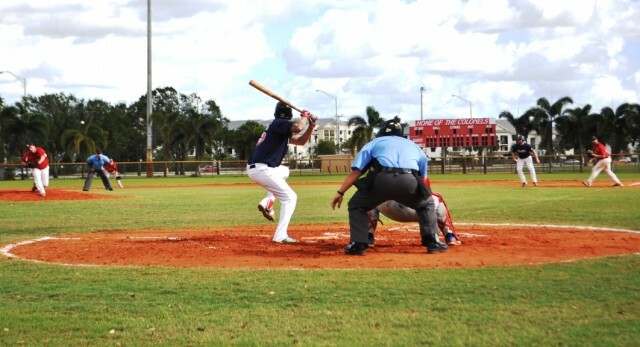 The Boca Red Sox feature a balanced attack, with 10 players hitting over .300 this season. Endy Acevedo is tied for the league lead in HR's with 3. Manager Eric Lyon has worked hard this season to keep his roster consistent, facing 2 double headers late in the season. Pitchers Chris Snevel and Brian Neal have shouldered most of the load, combining for 63 innings and 73 K's. The Red Sox are experienced and will be tough to beat, coming in as the #2 seed. After 7 seasons in AUBL Miami, this is the 1st time the South Dade Toyota Braves have advanced to the championship series. The Braves went undefeated this season and have a very deep roster. The Braves defeated perennial powerhouse Boer Miami 10-3 after defeating former champions Dade Diamondbacks 7-1 on 12/10/17 and The Dade Vipers 1-0 in round 1. The South Dade Toyota Braves have always been a top team in AUBL Miami, but this season has been their finest to date. Marco Pereira and Franklin Gonzalez lead the team offensively with very impressive numbers (Pereira .656 AVG, 1 HR, 17 RBI, Gonzalez .645 AVG, 19 RBI). 7 players are hitting over .400. The Braves have earned their #1 seed this season with top pitching and devastating hitting.